Henry will be putting up more details about birds seen and his pictures from the event as soon as he gets a chance. I am posting here a few of the pictures I had from my part of the day….while I have a chance! 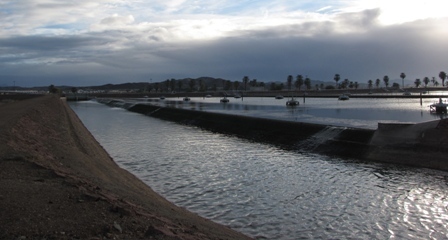 The Yuma Christmas Bird Count was held on Saturday December 15. Yuma birder Arlene Dancer was waiting for me before sunrise at West Pond on McKinley Road off of Senator Wash Road. We walked that area in a heavy drizzle till sunrise hoping for Black Rail which we did not hear. We did have Clapper and Virginia Rail and Sora though. We then moved her vehicle to Phil Swing Park at Imperial Dam where we had a bright male Vermilion Flycatcher. Next stop was the All American Canal Desilting Ponds which were loaded with waterfowl. We then made our way over the small pass by Senator Mine and came out at the foot of Senator Wash Dam. 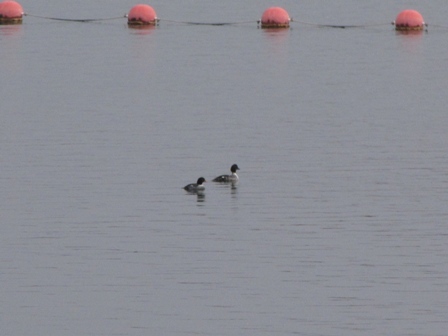 We were fortunate to find two BARROW’S GOLDENEYE on Senator Wash Reservoir. I have seen them more often at this one location on the reservoir over the years than any other spot. It seems they prefer a little less open water and were in the small cove near the outlet station part way across the dam. 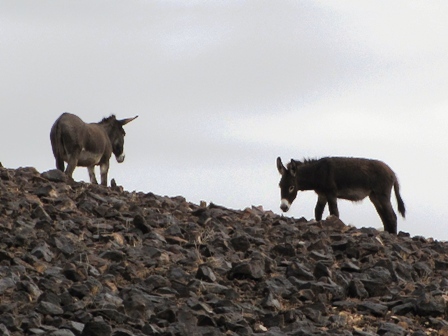 Three Burros were on the hillside at the end of the dam as the road drops down to Squaw Lake. 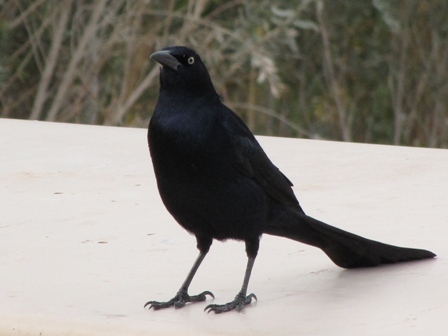 This male Great-tailed Grackle posed as a hood ornament on my Jeep before posing on this picnic table at Squaw Lake. Time flies when you are having fun so we beat it back to Phil Swing Park to meet the rest of the birders for lunch at noon. Tales of rarities and the lack of some expected common species, seeing old friends again. Great stuff! Arlene and I then headed out again to bird the desert north of Senator Wash.
After running the desert washes where we found Black-tailed Gnatcatcher, Verdin, Ash-throated Flycatcher and Gambel’s Quail we drove on up to Ferguson Lake so Arlene could see it for the first time. 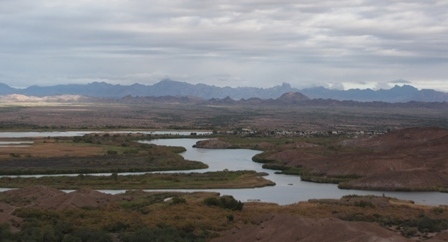 It is a truly great view from the top of the hill over the slot canyon in Ferguson Wash.
Ferguson Lake, Colorado River and Martinez Lake, Castle Dome and Kofa Mountains in distance. Picacho Peak stood prominently to the west of us. 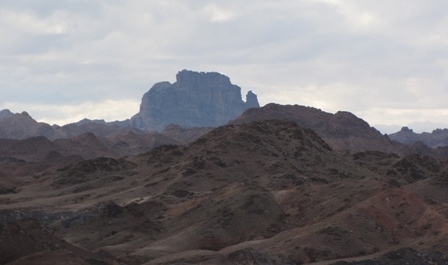 I had two friends join me for a desert campout and a three mile hike around the base of it on Wednesday December 19th. That was after the Salton Sea Christmas Bird Count on the 18th and before our little 4.5 mile hike through the Algodones Dunes Wilderness Area on the 20th so it has been a busy week and I have lots of stuff to post….. as soon as I get another chance! See ya at the sea………………..